A fter two years, North Carolinians now know the legal distinction between a mine and a landfill. That makes all the difference to residents of Chatham and Lee counties, where millions of tons of coal ash from Duke Energy are being stored in both abandoned mines and new, gigantic holes in the ground. 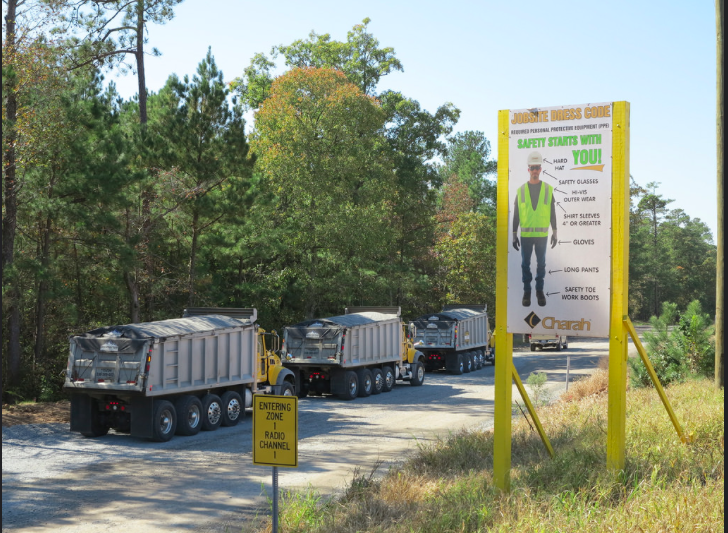 In a judicial order issued March 31, Chatham County Superior Court Judge Carl Fox ruled that the NC Department of Environmental Quality should revoke two of the four mine reclamation permits it had issued to the Charah/ Green Meadow company. Coal ash can be stored in old slate and clay mines in Chatham and Lee counties, Fox ruled. However, the material can’t be placed in newly excavated areas. Those are effectively landfills and subject to more stringent waste disposal regulations. In July 2015, three environmental and citizens’ groups — BREDL, Environmentalee and Chatham Citizens Against Coal Ash Dump — had filed for a contested case hearing over the permits. In May 2016, Administrative Law Judge Melissa Owens Lassiter had ruled that DEQ’s Division of Energy, Mineral and Land Resources legally permitted Charah/Green Meadow to dispose of coal ash not only in the former Brickhaven and Colon mines, but also in newly excavated areas. DEQ “improperly” issued permits for that unmined land, Fox wrote. Fox did agree with the original ruling that Charah/ Green Meadow can legally store coal ash in old mines. To store the coal ash, those former mines must have liners, leachate collection systems, caps and groundwater monitoring systems. The coal ash originates from impoundments at Duke Energy’s coal-fired power plants in North Carolina. As part of the Coal Ash Management Act, high-risk impoundments at three plants — Dan River, Sutton and Riverbend — must be excavated and closed by Dec. 31, 2019. A fourth plant, Asheville, had an original deadline of 2019, but following the Mountain Energy Act, it was extended until 2022 to allow a natural gas plant to come online. A Kentucky-based firm, Charah, formed a separate company, Green Meadow, to transport and bury the coal ash as “structural fill” in Chatham and Lee counties. At some point, the ash could be reused in concrete and other building materials. About 8 million tons of coal ash would be dumped in the Colon Mine, five miles north of Sanford in Lee County.The Brickhaven mine is located four and a half miles southeast of Moncure, in Chatham County. It will receive roughly 12 million tons of coal ash. Duke Energy spokesman Jeff Brooks said via email that the Brickhaven and Colon mine projects “are an important part” of the utility’s strategy to dispose of its coal ash by the state’s deadline. “We are hopeful that this matter can be resolved quickly and we can continue our work to safely close ash basins in ways that protect the public, the environment and the costs our customers pay,” Brooks said.